Guest post by Guy Farley, CTO of Bought By Many. Insurance isn’t, as many people perceive it, a “necessary evil.” It enables almost all significant human endeavors, from owning a car, to towing an oil rig into position. However, because the insurance industry is known for pulling sneaky maneuvers like low-balling first-year premiums to get customers in and pushing up prices on renewal; producing wording that is impossible to read; and rejecting claims (that many would expect to be covered) based on clauses buried in policy documents, they have cultivated a negative reputation among consumers—one that is often the polar opposite of the actual value insurance could (and should) deliver to society. From the insurers’ perspective, consumers often buy the cheapest policy they can find without checking what it covers and why it is so cheap. Insurers then enter price wars to compete for this business and end up relying on the somewhat dubious practice of price hikes at renewal to recover first-year losses. In the UK in particular, the battle to have the lowest price has been fuelled by comparison sites. To create an insurance policy that actually makes insurance better for everyone, companies need to look beyond just making things clearer and fairer. Insurance companies need to make products that people want, rather than the ones insurers want to sell. 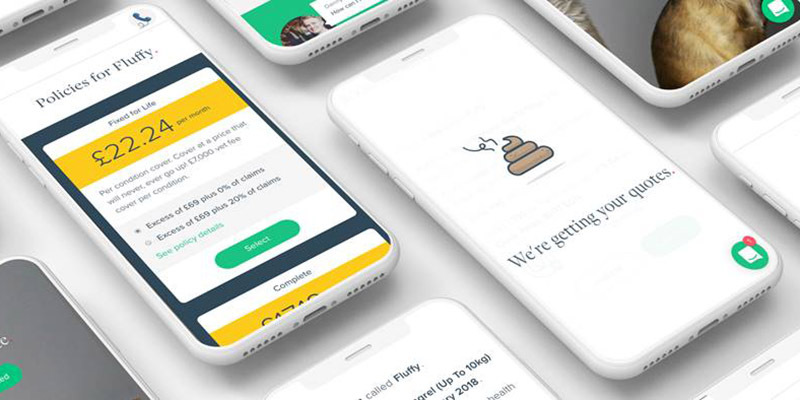 At Bought By Many, an insurance startup co-founded by Steven Mendel (CEO) and Guy Farley (CTO) in 2012, we engage with thousands of customers, largely on Facebook, to understand what they dislike about existing insurance products and what they would like from new ones. We also analyze millions of lines of search data to understand what people are looking for. We use this unique insight to design our products. For example, pet owners told us they felt aggrieved when, having insured their pet for years without claiming for a visit to the vet, their premium jumped up as their pet turned 8 years old. From an insurance perspective, this is logical, as older pets go to the vet more. From a customer perspective, this feels unfair. In response, we created the first Fixed For Life pet insurance product: the premium remains the same for the entire life of the pet. Having insight and data to inform the design of new products is therefore useful, but you need a tech platform that lets you get them to market quickly and at a reasonable cost. This is where AWS has completely changed the picture. To those outside the industry, managing insurance policies sounds like a simple technology problem. In reality, it is far from simple. All insurance products have radically differing schemas and policies can exist for many years while their individual schemas change during their lifetime. They are affected by an enormous number of real-world events: moving house, death in the family, buying another cat or a new watch, getting married or having children, not to mention incurring losses and claiming. The claims and disputes about them can occur years after the policy has expired. Insurance is highly regulated and regulation is different in every country, and in every state in the US. It’s a scary picture. For decades, all of this functionality has been shoehorned into a single monolithic relational database-based system, creating extraordinarily complex solutions. The only practical path for insurers was to buy a huge platform from an established vendor, spend millions of dollars on implementation, and hope their system gets you over the line. AWS, with some help from document-oriented storage, allows us to reimagine this problem and break it down into a manageable set of solution components. Document-oriented storage allows policies of different types to exist in the same repository and go through many versions over time. Step functions can manage the complex lifecycle. Kinesis streams manage the torrent of real-world events, with Elasticsearch providing a scalable, searchable history of those millions of events. Lambda functions allow rating engines to exist almost indefinitely at very low cost. API gateway natively validates policy schemas. Cognito provides simple authentication and permissions differentiation between customers and staff. All of these different patterns used to be an epic relational state management challenge; now AWS has made it possible for a small (but talented) team at Bought By Many to tackle what used to be unimaginable, building policy administration in-house from the ground up. We’re 100% serverless and exposing an API for Insurance: the tech to allow us to make insurance better, for everyone.